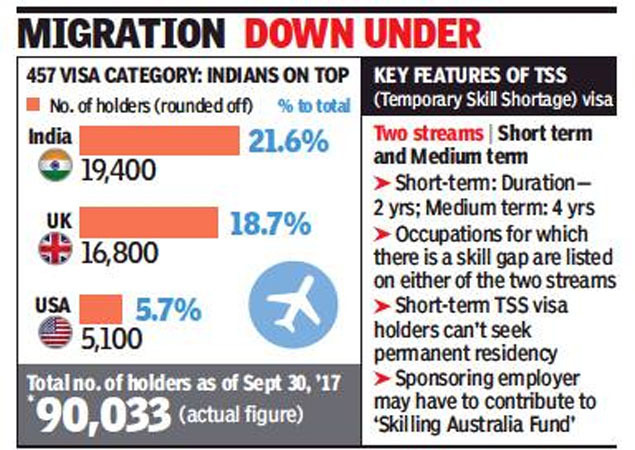 MUMBAI: The most popular route to Australia—the subclass 457 visa category for skilled overseas workers— has been abolished by the Australian government. Instead, a new Temporary Skill Shortage (TSS) visa has been introduced from March 18. The abolished visa was a popular route for Indians headed to work Down Under. Of the 90,000-odd holders of the 457 visas, 22% were Indians. While TSS will continue to enable overseas workers to be hired, the bad news for Indians eyeing permanent residency is that the new norms are restrictive. Further, new job entrants, including Indian students who have qualified from Australian varsities, may find it more challenging to get a job as a minimum work experience of two years is required. Hiring overseas workers will be comparatively more costly as it is proposed that sponsoring firms must contribute additionally to a skilling fund. Labour testing norms, aimed at ensuring locals are given the first opportunity for a job vacancy, are expected to be more stringent, even as final rules have not yet been announced. Australia lists occupations where there is a skill shortage and for which overseas workers can be hired. The migration reform process began several months ago, in January an updated list for skilled migration visas was issued with significant pruning of occupations and some reshuffling of skill categories. Another list may follow in the coming months. For the year ended September 30, 2017, cooks, resident medical officers and restaurant managers were the top three occupations to be allotted the 457 visas. The Australia 457 visa had a maximum duration of four years. According to the Australian Department of Home Affairs, TSS visa has two main streams. A short-term stream that enables hiring of temporary expat skilled workers in occupations included on the Short term Skilled Occupation List (STSOL). The duration of this visa is a maximum of two years, it can be extended to up to four years, only if an international trade obligation applies. The second stream is a medium-term stream where expats can be hired for occupations included in the Medium and Long-term Strategic Skills List (MLTSSL) and its duration is for up to four years. “On the flip side, a management consultant was moved from STSOL to MLTSSL list, which means they can now apply for permanent residency pathways,” adds Mistry. TOI’s review of the occupation lists for IT workers shows that computer network and system engineers, and software engineers are on the MLTSSL list, but software testers and hardware technicians fall in the STSOL list, eligible only for a short duration TISS visa. Hiring expats will be more costly. “A ‘Skilling Australia Fund’ (SAF) Bill is being debated in the Parliament. Once passed, the sponsoring company may need to contribute to the SAF at about Australian $ 1,200 per employee nomination, for each year of the visa tenure. So if a company wants to hire an expat software engineer for four years, they may have to pay a levy of Australian $ 4,800,” says Mistry. – There are two streams of TSS, a short term and medium term.